Grant Achatz at Chicago's award-winning Alinea, where mad scientists in the kitchen ensure that each dish is an experience. No matter how finely crafted a meal is, you always feel a little bit like an animal when you're eating it. Even in an elegant Paris bistro or an austere Kyoto sushi palace, you still know that you're greedily packing food into your stomach. But not when you eat Grant Achatz's food. In fact, at his Chicago restaurant Alinea, you almost don't feel as if you're eating. Until about the 16th course, when you start to get full, it seems as if you're merely thinking about food. A bite of fried pheasant breast, for example, arrives kebabed on a branch of burning oak leaves, the smell of which is meant to evoke the Michigan fall of Achatz's youth. The aroma, he is fond of noting, can conjure up such powerful memories that it makes some diners cry. 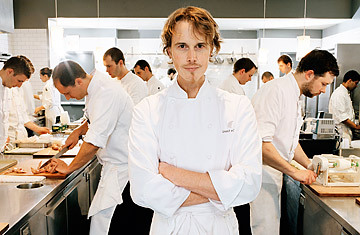 If most chefs are musicians  soul, rock-'n'-roll or punk  Achatz is a poet. Nearly all his dishes are so precise and delicate, they are plated with tweezers. Although the food is delicious, it's also embarrassing, like someone's revealing too much to a stranger. It forces you to think about every bite. It's anti  comfort food. It's also the kind of food that pisses people off. Even though it can take months to get a reservation, even though the basic prix fixe meal is $195 before drinks, tax and tip, and even though Alinea has won every conceivable award (Gourmet magazine's best restaurant in America, the continent's highest entry on S. Pellegrino's list of best restaurants in the world and, most recently, three stars from Michelin), some people still walk out midmeal. "It's so hypocritical," says Achatz (whose name rhymes with rackets). "People will be carrying around iPhones, but they won't accept change in other mediums like food and art and music." Though almost every dish starts with an immaculate, classic base like a veal stock, the Alinea kitchen is really more of a Willy Wonka factory. One cook fills plastic bags with puffs of Earl Grey tea from a vaporizer, a machine otherwise used only by hard-core pot smokers, and then wraps a linen pillowcase around each bag, which will be punctured with a needle and put under a diner's plate to release aroma. Someone else is testing a superchiller that cools liquid so slowly, it can get below its freezing point without the molecules ever moving enough to attach to one another and form crystals, but as soon as you stir or shake the liquid  bam!  it instantly forms shards of ice. Strange things are being done to pieces of Bubble Yum. Each of the kitchen's experiments is meticulously documented by a full-time videographer, with a researcher writing down descriptions and taping vials of food to the corresponding pages. Similar care goes into the front of the house, where the reservation system includes notes about repeat customers, like "Wife and daughter are left-handed," so servers know where to put utensils. The whole place feels like a Pynchon novel in which a bunch of lunatics are employed by a military contractor with a really fine palate. Achatz, 36, is a slight, serious, goateed redhead who wears a scarf and says things at his staff meetings about how today is the day he can smell the season changing. He is not, despite all the artiness and calm, lacking in ambition or confidence. At a November staff meeting upstairs in his modern-looking restaurant (which is so minimalist, there's no sign outside alerting passersby to its presence), he toasted his staff with bottles of Krug Champagne to celebrate winning three stars in Michelin's first Chicago guide  a goal he wrote down when he opened Alinea in 2005, even though Michelin had yet to come out with any restaurant guides in the U.S. Alinea is one of just 93 restaurants in the world to hold three stars. It's an elite ranking, and after Achatz's toast, one of his sous-chefs, Andrew Graves, lifted his glass and confided, "I just want to say that I'm relieved." "Imagine if we got two stars? Ouch," said Achatz. "Did we really think we wouldn't get three? No. We all knew. Because we care. We really, really care." Then they went to work. It was like watching the Yankees celebrate getting into the playoffs. Achatz is so confident in his cooking methods that he let me work in his kitchen for a night. Crazier still, I mostly made risotto, upon which white truffles were shaved for an additional $75  a cost, I firmly believe, for which TIME should reimburse all diners who ate the night I cooked. I worked for seven hours, and in that time  even though there are 23 courses to serve each table  not one dish was scrapped, not one utensil dropped. When one of my eyelashes fell onto a plate, a chef several feet away stepped in to remove it before I even noticed. The dozens of cooks work on carpet because so little is spilled. There is no yelling, no music and almost no talking. It is also the only kitchen I've ever seen where  thanks to the amount of precooking and high-tech gadgetry  not only are the fans above the stove often turned off, but also the building's heater is turned on.